Discover a whole new way of living in an exclusive community surrounded by lush, green landscape at the heart of Capitol Hills, Quezon City. When you choose to live in Golfhill Gardens, you get the advantage of a lower density living environment. It is designed to have fewer units per floor, which means more time and space for you and your family to enjoy the recreational features and amenities. 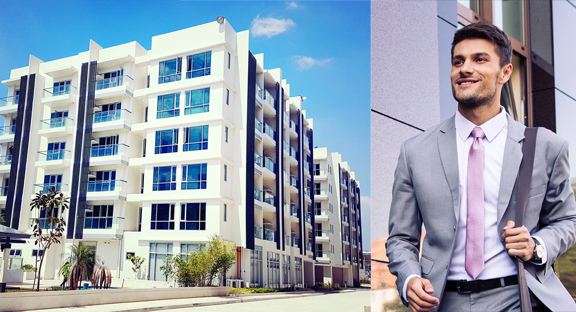 Having a residential unit in Golfhill means you will be getting abundant natural light combined with an airy and spacious atmosphere. You can therefore experience the many health benefits associated with increased exposure to natural light. 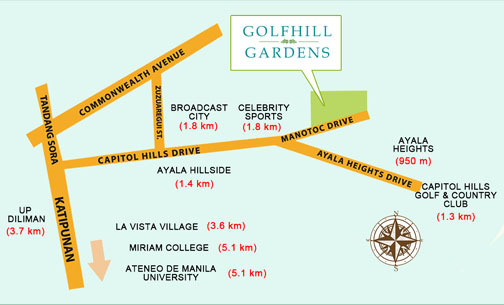 Golfhill is located in the peaceful and safe neighborhood of Capitol Hills, Quezon City. Compared to high rise buildings situated in business or entertainment areas, Golfhill will allow you to enjoy its relaxing atmosphere, away from the hustle and bustle of city life, but still a few minutes away from city comforts. The refreshingly quiet ambiance is similar to that of a small community’s. You as a resident will feel a sense of belonging. You can also bond with like-minded neighbors who treasure the same things as you – security, privacy and a comfortable environment. When you call Golfhill Gardens home, you enjoy a privileged location that links you instantly to a topnotch university town. Right in your neighborhood are Ateneo de Manila University, the University of the Philippines-Diliman and Miriam College, where the best and brightest minds are honed. Holy Family School, Claret School, Quezon City Science High School and Philippine Science High School are also nearby, expanding the circle of academic excellence for your family.